even when I'm sleeping I look cool! I pretending to be asleep, but these shades mean I can see all! I suspect this to be the truth! It does look a bit like that, doesn't it! I'll have you know all the cool kids are rocking the crochet mother! One word of advice kids always stay cool and wear your shades even when riding in your stroller! That's right! Just don't tell the optician that you're wearing them inside, they'll tell you off! I remember when all this was fields...gah, the youth of today...how much for a cucumber? !...where did I put my glasses?...my pocket money was never so much as a farthing...what happened to manners? 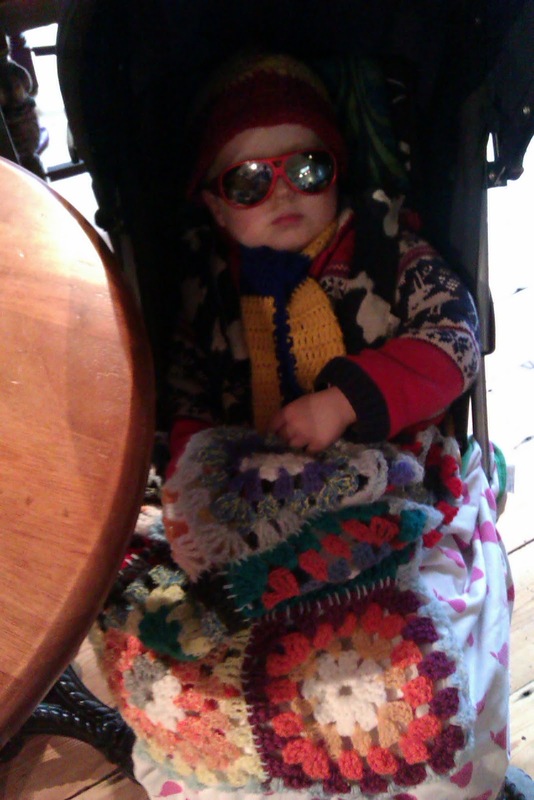 Newsflash: Elvis spotted in baby buggy! I WILL look cool whatever you cover me up with Mum!